Sabbat are a cult Japanese band known for primarily for being Japanese and playing a heavily Venom influenced style of Heavy metal that sometimes crosses over to real black metal though rarely and for the briefest of periods. This record is actually more known for the exotic origins of its creators rather than the actual quality presented here. Replacing the seriousness of other similar bands with a certain rock and roll cheese and tongue in cheek lyrics that ultimately pull this band behind the rest. Sabbat have a terrible habit of wearing their influences on their sleeves with far too much pride. 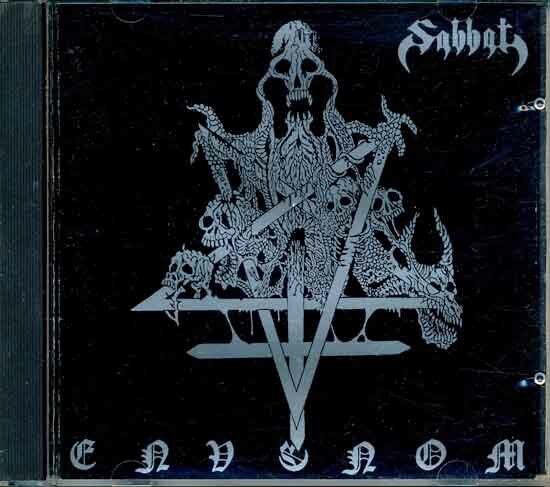 “Satan Bless you” has a main motif particular similar to Venom’s “Black Metal” and all of the speed metal parts can be attributed to the English Sabbat. “Evil Nation” is so reminiscent of Iron Maiden’s “2 minutes to midnight” that you can easily sing the verse parts on top of it and there would be almost no difference as the chord progression, rhythm and techniques are practically identical. Carcassvoice steals the first two passages of Mayhem’s “Deathcrush” and only slightly changes the rhythm and added to this package is a hilarious imitation of Maniac’s high pitch rasp. Though these are the most obvious acts of plagiarism, the entirety of the album is drenched in déja-vu and this refrains the album from reaching the same level as their Norwegian and Brazilian peers. Arrangements tend to be in the classic pop style except for some brilliant moments of over the top soloing and the inclusion of speed metal breakdowns. Though some tracks experiment with the stop and start mechanics from Motorhead’s Overkill (1979) but ultimately fail as the individual parts function in solitude but do not combine as a whole and we are treated to separate songs encapsulated within a single track. There is nothing to be found of the narrative Death and Black metal structures here as this album is firmly rooted in Heavy metal. The note selection stays within the usual combination of the natural minor scale and the minor pentatonic except when the band allows themselves forays into fully developed black metal territory as seen on track “King of Hell” which has a long droning sequence with a lot of chromaticism that contrasts most of this record but then on closer inspection this feels more like a reject on Bathory’s The Return (1985). The drums hint towards more developed black metal at times as they play a martial techno beat here and there without fills but this record is exceedingly behind what was going during that time period. The best part of the entire record are the solos and how are they given the kind of space and freedom suited for the more commercial strands of metal. The solos first and foremost obey the whims of the accompanying riffs and seek to amplify what they convey with the use of a large repertoire taking from the most famous relevant shredders. The compositions do have their charm in how they use the energetic approach of their heroes to create uplifting and fun music but ultimately play on shock rock tropes like main influence Venom. The best composition here is the instrumental “Dead March” which takes a simple Judas Priest like motif and advances it forward with perfect control of mood as the motif twists and turns and the interactions between it and the second guitar that either harmonizes in conventional thirds or plays some contrapuntal melodies. The song conveys perfectly a march of the dead and escapes the pop structure through the reuse of certain passages and a complete lack of chorus. A fantastic bridge between the Heavy metal of the past and the Black metal of the future as it takes those elements and applies it in ways that the Norwegian bands would then apply on darker melodies. Envenom shows a band going through multiple periods as this album was released seven years after the band initially formed and shows this progression from NWOBHM worship to Mayhem’s Deathcrush unfortunately this record shows the timeline of the genre but fails to do anything with it nor add a unique twist to it. Envenom remains a fun record but lacks any transcendent quality that separates it from some of the more forward-thinking acts in the genre and probably because there seems to be not a single ounce of influence from what was going in the Death metal or a willful ignorance to the innovations brought over. An easy listening album to bring over neophytes but for the experienced listener this is enjoyable for a few listens with a beer or two but has nothing else to offer.